The provincial government recently announced plans to capture the remaining six caribou from the South Selkirks and South Purcell herds and translocate the animals to a maternal pen near Revelstoke. This is the latest chapter in an ongoing heartbreaking story of a species on the brink. As one of North America’s oldest mammals, southern mountain caribou survived ice ages 12,000 years ago. Once abundant throughout the Columbia, today they exist in 18 isolated subpopulations, hanging on in remote areas of our heavily-altered mountain landscapes. Last week’s government announcement came as no surprise—the situation is dire. The decline of mountain caribou has mirrored the destruction of the inland temperate rainforest ecosystem. As industrial disturbance increases, caribou populations decrease. The truth about extinction or extirpation is that we don’t fully understand the complex ecological effects when a species disappears from the landscape. What does the fate of local populations of mountain caribou in BC tell us about the future health of other species that rely on the same temperate ecosystems the caribou rely on? Animals like fishers, wolverines, flying squirrels, northern goshawks and grizzlies. Caribou are the ‘canary in the coal mine.’ These herds, once abundant in our Columbia Mountains and now reduced to tiny isolated herds, are an indication that we are facing an ecosystem in crisis. This is a wake up call to wildlife managers, citizens and politicians who must take proactive steps to protect and enhance habitat and ensure the health of the inland temperate rainforest as a whole. The mountain caribou conservation story in Southern BC is not over and I will personally commit to doing everything in my power to push to restore and recover healthy caribou populations. The BC government’s plan is to capture the caribou when the snow is hard-packed enough and transport the remaining individuals from the South Selkirks and South Purcell herds to the Revelstoke maternal pen. A captive breeding program is also being planned so that there can be a source population to introduce mountain caribou back into areas where they are likely to succeed. Even though there will be no mountain caribou in these landscapes for years to come, habitat protections for the South Purcells and South Selkirks will stay in place in all habitat areas. That means that winter access closures will remain and will be enforced under the provincial wildlife act. Once intensive recreation has been established in an area it’s difficult to enforce and enact closures for habitat refuge. This winter will be a critical one for the remaining caribou, as the planned capture timing for both herds is unknown and packed trails from winter recreation increases access for predators and puts the caribou at risk. Logging and road building in protected caribou habitat will not be allowed as these landscapes are recovering and the caribou will need a suitable landscape to be introduced back into. Caribou recovery is not a short term initiative, there will be setbacks and herd losses. It will span generations and will ultimately set a precedent for how we recover a species and an ecosystem on the brink. A glimmer of hope is offered by recovery efforts lead by The Saulteau and West Moberly Nations’ in central BC. The Klinse-za herd has nearly doubled in size since recovery efforts began in 2014, with 67 caribou in the herd today. These recovery efforts, including strong habitat protections, restoration of the landscape by closing and rehabilitating roads and speeding up cutblock growth, a maternal pen and a predator control program, are beginning to show that mountain recovery is possible even in heavily impacted landscapes if there is a comprehensive recovery effort. 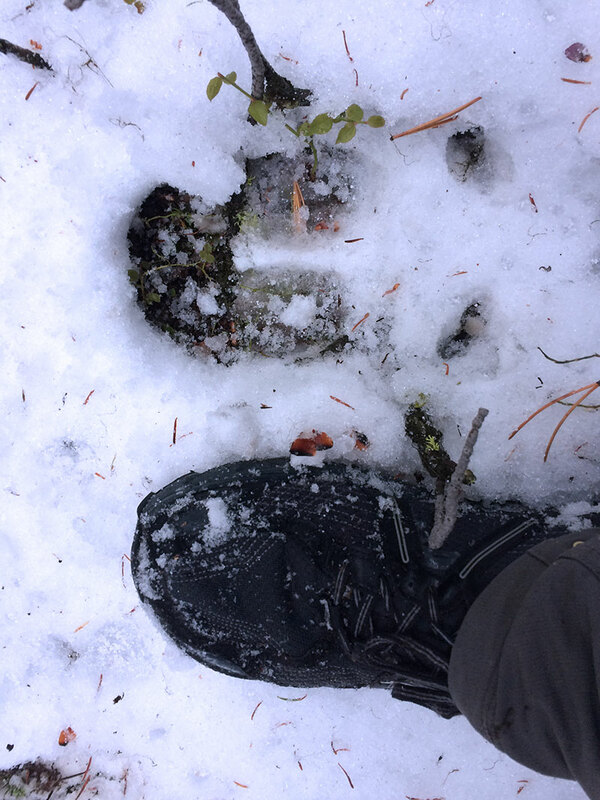 Last weekend on a cold snowy day I hiked into the heart of the Southern Purcell range, a crescent shaped hoof print in fresh snow lead me down through subalpine forest filled with ancient whitebark pine. My heart raced as I followed the track into a lower elevation cutblock. Maybe in 30 years we’ll see a whole lot more of those crescent shaped tracks in that same caribou country.